“What are you eating?” my friends cried, jaws dropping in horror. 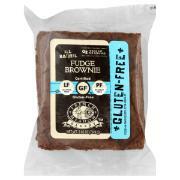 I had just brought out a rather fabulous gluten-free fudge brownie, courtesy of French Meadow Bakery. Were they exclaiming about its gluten-free nature? Disdaining its lactose-free assurance? Scoffing at its peanut-free advisement? No. It was the fat content. This awesome chocolatey square has 16 grams of total fat, with 1.5g lent to saturated fat. Total calories are 350, with 140 of them fat calories. And apparently, that’s much too much. I don’t really concern myself overmuch with the amount of total fat, because in my experience, if something is shouting I Have 75% Less Fat! that means they’ve made up for it in other ways, such as with sugar or sodium. Or fake sugar and fake sodium. Truth is, I don’t know how much fat is too much. I seem to be doing all right so far on my mostly-macrobiotic program. I’m in better shape now than I was a couple years ago, though I don’t seem to be able to stop craving things that don’t get with the program. But I also don’t plow through boxes of chocolate squares or giant bags of sour cream and onion chips (mmm!) or other deliciously hedonistic food. I may want to. They may be within my reach. But I don’t. Ideally, I want something that gives me the fat I need without me having to worry about what else it’s doing. I love guacamole, for example, because not only do your taste buds get a luscious nirvana-like experience, it’s the “good” fat. Yes, it doesn’t come lightly, but I’m also not eating pounds of it at a time either. It’s all about balance. You want that brownie, you have to weigh it against what else you’re doing—or not doing. I’ve tried the not-exercising thing over the years and you know what, it doesn’t work, so I’ve finally given in. You eat, you exercise. I also try to eat when I’m hungry and stop when I’m not (this works about 87.9% of the time). For me, balance—or wellness, or quality of life—just doesn’t come from agonizing over fat grams. Very reasonable attitude. I mostly eschew low fat things because they are all too often low flavor, too. I’d much rather have a block of something horrible for me but so so so so delicious once a month than a daily dose of bland sawdust compressed into a block of nasty. PERFECT way to sum it up! Despite their high “fat” content and numerous diet magazines telling you not to eat them, I don’t believe anyone can get fat from eating an avocado. Or anything else that’s natural and not full of man-made, god-awful, who knows that. Yes, I can go a bit irate over so-called “healthy” food when it really isn’t. Quality of life and Taste Bud Satisfaction are one thing (if you lump them together, which I do), and a brownie isn’t Mr. Healthy, but it’s better than yogurt with sucralose in it.